We start with a big announcement: Our favorite Lonely Alcoholic White Girl Soda, SIMPLER WINES, is moving on up. Coming soon to a Trader Joe’s near you is the 375 ml can of Simpler Wines for only $2.99. We are especially excited about the addition of a red blend and chardonnay. The ingredients this week included the seasonally stocked Green Cabbage (with a reminder to stock up on your raw, seasoned corned beef for St. Patrick’s Day before they sell out! ), the versatile Matcha Green Tea Powder (which is a pantry mainstay) and Sriracha Potato Chips, which were stellar on their own (#eatin’chips). Our friend, Heather Forte (remember her from Episode Five?) always raves about the Chick-Less Nuggets that seem to always be out of stock in her local Trader Joe’s store. Not only did we make a delicious vegetarian meal out of this ingredient, we also did her a solid by putting three bags on hold at her local store. What to do with all these ingredients? Tacos, of course. I love Tacos, and could eat them all day and all night. The chick-less nuggets have a mandarin sauce, which I took and combined 2/3 of it with mayonnaise, honey, and adobo sauce, and turned it into a creamy sauce to top our tacos. The other 1/3 was reserved to toss the nuggets in. Another taco topping was a corn and cabbage cole slaw, tossed with lemon zest, cilantro, honey and olive oil. This also makes a great side salad and will last a few days in the refrigerator. I had a pot of pinto beans soaking overnight when we began the episode. Trader Joe’s doesn’t sell raw pinto beans, but they do sell raw black beans, which can be prepared this same way. If you don’t have the time to make beans from scratch, you can always use canned beans, but they really don’t compare to a delicious pot of freshly cooked beans. To take these up a notch, we embraced our inner stoner by combining the sriracha potato chips and the cooked beans in a blender, and then pan frying them, making Potato Chip Infused Refried Pinto Beans. The best was the addition of crunched potato chips on top. It really completed the dish. Lastly, we used the MUY BUENO COOKBOOK Recipe for the churro dough, since I have made (and loved) recipes from here in the past. Check out her recipe for the churros we made in this episode. Instead of tossing in just cinnamon and sugar, we used 1 cup of sugar, 2 Tbsp Matcha Green Tea Powder, and 1 Tbsp ground Cinnamon. I didn’t really execute the churros as well as I had hoped. The dough was too hard, it would have been better to use a mixer, or to follow the time guidelines put forward int he recipe. My piping bag was also clogged, so I ended up making nuggets or snakes, which didn’t have the traditional churro shape. I also admittedly am the worst at deep-frying, so my technique was way off. The idea was great in theory, but the execution just wasn’t there. Grill or microwave corn then remove kernels with a knife. Thinly slice cabbage, chop cilantro. Combine in a bowl with lime zest and juice, olive oil, honey, salt and pepper. Toss well and refrigerate. Cook Chicken-Less Morsels according to package directions up until mixing with sauce (choice of baking or pan frying). Set aside 1 Tbsp Mandarin sauce to toss chicken-less morsels in after it is finished cooking. Meanwhile, combine 2 tbsp of the Mandarin sauce with adobo sauce, orange juice and Mayonnaise. Refrigerate until ready to serve. Once everything is ready, heat corn tortillas on a griddle, place 5 Chicken-Less Morsels in the center, top with coleslaw and adobo-mandarin sauce. Soak beans in water overnight. When ready to make beans, drain water and replace with fresh, and cover with water (about 1 inch above where the beans are). Add salt, bay leaves, garlic, bouillon and diced onion. Bring to a boil and cook for at least an hour, until beans become tender. Add more water and salt as needed. Normally, I would call it a day and just enjoy my pinto beans, but to take it to he next level, add 2 cups of beans and 1 cup of sriracha potato chips to a blender. Mix on medium for about 45 seconds, until smooth. Add olive oil to a pan and heat over medium heat. Add blended pinto beans and sauté for about 2 minutes. Turn on low and cover until ready to serve. Top with crunched up potato chips. My mother-in-law’s chocolate chip cookie recipe is something held sacred among her boys. At first…no, I wouldn’t change the recipe. But then after multiple failed attempts, I started to veer off and blaze a new trail. Side note/Fun fact: I can never stick to a recipe. I always have to add a little this or a little that to make it more *me. * This aspect of my personality drives my other half absolutely bonkers. Lucky for me, my daughter thinks it is super fun. If it were up to her, we wouldn’t use a recipe (or logic even) for anything we make. Bless her heart, she just loves to be in the kitchen with me. Most days of the week, my daughter asks if I want to make cookies with her. I know that she is ultimately asking because she is Cookie Monster’s mini-me, but I like to give her the opportunity to help out as much as possible in the kitchen and pass my knowledge on to her as often as I can. It’s a good life skill to have! So we usually make a little something together a few times a week. Today, I had a container of oat bran staring me in the face (purchased to make Honey Raisin Oat Bran Muffins) My MIL’s chocolate chip recipe calls for oats, so I figured I would start with her recipe as a base and make a few…alterations. First thing I did was swap out the Old Fashioned variety for Oat Bran. When oats are harvested, their inedible hull is removed and you have Oat Groats. Groats are made up of three parts: the Bran, Endosperm and Germ (Click here for more information on those layers). In a nutshell…The BRAN layer is the outside layer, rich in protein, fiber, antioxidants and B-vitamins. The ENDOSPERM is the large middle layer that is rich in starchy carbohydrates, and also contains some protein as well as small amounts of vitamins and minerals. The GERM is the innermost layer that contains lots of healthy fats and b-vitamins as well as some minerals, protein. Old Fashioned Oats come from a processing technique that steams the oats and then rolls them flat, giving you all three parts of the groat, thus making it a whole grain. Oat Bran is not considered a whole grain, because it is just the nutty outer layer that is full of fiber and protein. Looking at the nutrients side by side, Oat Bran provides significantly more fiber and protein, and has a texture closer to flour, so it works well in baked goods. Not saying one is superior to the other, they are just different. Some other swaps I made were changing half of the flour to 100% White Wheat Flour, substituting honey for part of the sugar, and adding cinnamon. The result was surprisingly delicious, probably the best luck I have had with this recipe yet! Preheat oven to 375 degrees. Cream butter, shortening, sugar, brown sugar and honey in a mixer on medium-high speed for a few minutes, until light and fluffy. Add egg, salt, baking soda, cinnamon and vanilla. Mix well. Add Oat Bran and Flours until combined. Add Raisins and Chocolate Chips according to taste. Space cookies at least an inch apart on cookie sheet, as they spread. Bake for 10-14 minutes (smaller cookies 10, larger cookies will need more time). With a spatula, transfer to cooling rack and enjoy! *I really am not a huge fan of shortening, because most contain partially hydrogenated oils (trans fat) and other chemicals that don’t belong anywhere near our bodies. But I do seldom use it in some baked goods because it does create a superior texture for cookies. Trader Joe’s doesn’t have shortening (that I know of), so you can use 1 cup of butter as opposed to part butter/part shortening. OR if you have some lard on hand, try that. I use All vegetable crisco baking sticks because they have no trans fat (the oil has been fully hydrogenated to saturated fat as opposed to partially hydrogenated to a trans fat), but they still aren’t the best option. I haven’t really found an alternative, so if you have any tips or tricks to replace shortening in cookies – leave a comment below! I love me a good Bran Muffin. …and we’re not talking the healthy kind! The more the honey and sugar to disguise the bran, the better. It’s for this reason, my bran muffin consumption usually falls in the “special occasion” category. BUT WHAT IF I WANT THEM ALL THE TIME?!?! Some of the changes included swapping the regular flour for my favorite 100% White Whole Wheat Flour, swapping out the oil for a mix of melted butter and mashed banana, and drastically changed the glaze entirely (that one was painful). I also added some extra flavor in the form of vanilla extract and pumpkin pie spice. Is it nearly as decadent as I am use to? No. But is it a whole lot healthier and tasty enough for me to enjoy? Absolutely. This would pair really nicely with Vanilla Greek Yogurt and Berries for breakfast…and Coffee…Of course. In a separate bowl, combine the next seven ingredients (the wet ingredients). Create a well in the dry ingredients, and mix the wet ingredients into the dry until just incorporated (don’t overwork this). Grease muffin tin (I use the coconut oil spray), and place ~ 1 Tbsp of batter into each section. Should be 1/2-3/4 full. Remove while warm and place on a plate. Cover with glaze (about 1/2 tbsp per muffin). Glaze will fall down the top of the muffin and gather at the bottom of the muffin. Best when consumed immediately and piping hot! By a show of hands, how many of you have seen some one boasting about their chia-seed-filled breakfast on social media? 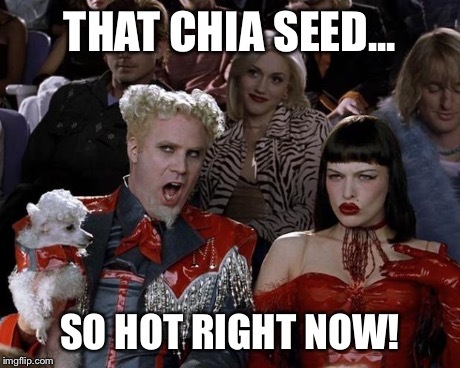 Or how about having a Pinterest feed full of chia seed recipes? I know mine is up! As with most trends, I need to make sure it is tried and true before I start to experiment with it. Every time I go to Trader Joe’s, I see the small bag of chia seeds and am always so tempted to get it, but really, what would I do with them? But really, why not get them? I shouldn’t let my lack of creativity stop me from these awesome little guys. Chia seeds are a nutritional powerhouse, with just one tablespoon boasting 70 calories, 6 grams of fiber, 3 grams of protein, and 5 grams of fat (mostly polyunsaturated, 3 of those grams are the omega-3 fatty acid ALA). The recipe for a very basic chia seed pudding is one part chia seeds to four parts milk (of your choice), and from there you can customize with whatever sweetener or other additions you want! I packed this for a snack at lunch, and I could barely finish because it was so filling! This makes for a great breakfast that will leave you satisfied for hours. 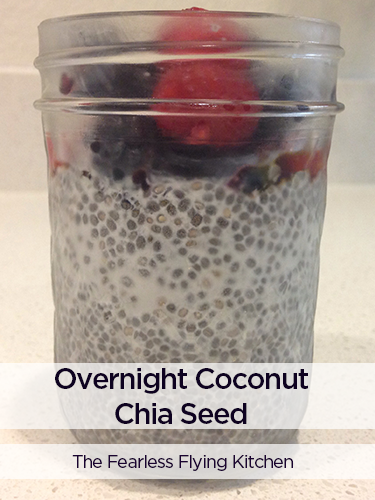 Place chia seeds and coconut milk in a small, sealable container and stir. Let sit 2-3 hours, or overnight, in the refrigerator. Once set, give it a good stir and try a small bite to see how much honey you need (1-2 tsp, or none at all if the sweetness from the coconut milk is enough for you). Top with mixed berries and enjoy!